The 2009 Durban Airshow, sponsored by the City of Durban this year, took place on the 11th and 12th of July at the Virginia Airport, which is located along Durban's North Coast just over 10 kilometres from the city centre. The airport is situated right by the sea and the runway is about 150 metres from the beach. Virginia Airport is one of the best places to watch an airshow from, as the crowd line at this airport is only 50 metres from the edge of the runway. 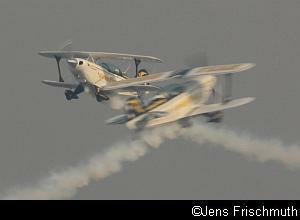 Johan Juselius, chairman of the organisers, the Durban Wings Club, calls it "the world's most intimate airshow". 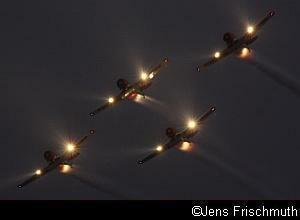 The Durban Airshow is South Africa's longest running airshow and this year took place for the 53rd consecutive year. Various displays from this event will be remembered for a long time. One of the highlights was the awesome formation flown with two South African Airways (SAA) Boeing 737s, the Silver Falcons and the two SAA Harvards. This flypast was put together by SAA as a tribute to Scully Levin, one of South African Airways' leading pilots and a legend on the South African airshow circuit. 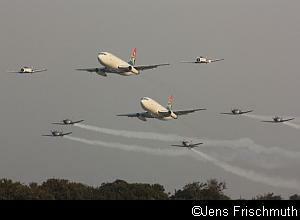 Scully is due to retire from South African Airways in two and a half months time and this was Scully's last major airshow in association with SAA. Also, the publicity shots of this formation done over Durban and the new soccer stadium will be used to promote the 2010 Soccer World Cup. After the flypast and a formation break over the airport, the two 737s flew wingtip to wingtip in a superb display. The display ended with a formation break and individual low-level flypasts by both planes. Another exciting highlight was the breaking of the sound barrier by the Mirage IIICZ. This was the first time in over 45 years that the sound barrier was broken at a Durban Airshow. 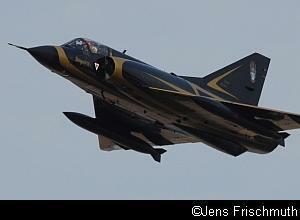 Lt. Col. Glen Warden expertly flew the Mirage IIICZ, the only Mirage IIIC in the world still flying. The plane performed a flypast and then climbed to altitude and went supersonic out at sea, where it accelerated to Mach 1.3. The shock wave never reached the airport at the first attempt and Glen had to reposition the plane for a second time before the double sonic boom reached the expectant crowd. The pilot was plugged into the public address system the whole time and the spectators could follow every move of the fighter. As a salute, Glen performed another flypast but he did not have enough fuel left to perform a full display. The Mirage consumed fuel at the rate of a gallon per second. That would have to wait until later during the day. The Mirage IIICZ flew its full display routine late in the afternoon when the afterburner was clearly visible in the fading light. The routine included a touch-and-go to the delight of the crowd. The Mirage had to operate out of Durban International Airport as the runway at Virginia Airport is too short for it to land or take off. Various people, including South Africa's leading airshow commentator Brian Emmenis, commented on the absolute silence that fell over the airfield during these events. Brian had never seen such a large crowd so quiet as everyone was glued to the action. 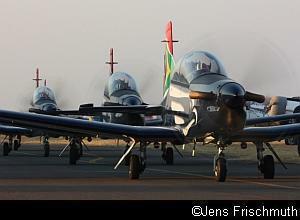 South Africa's top aerobatic pilots were present at the airshow and flew many superb routines. Scully Levin flew a tight display with his son Ellis in the two SAA Harvards. Scully and Ellis are also part of the Flying Lions Display Team, where they are joined by Arnie Meneghelli and Stew Lithgow and perform superb manoeuvres including various formation breaks in their Harvards. The same four pilots also made up the Gabriel Wings Team, where they flew Pitts Specials. The Goodyear Wizards, also flying Pitts Specials, performed many high impact manoeuvres including stall turns, head-on passes and knife-edge passes. The team is made up of three ex- South African Air Force fighter pilots in Dennis Spence, Neil Trollip and Glen Warden. The North West Eagles and Mazda Zoom-Zoom teams, both flying Extra 300s, also performed amazing routines. Especially impressive was the knife-edge pass flown by Larry Beamish in his Extra 300 just metres above the runway. Besides the Mirage IIICZ, Dave Mandell's Aerovodochody L-39 Albatross jet and the Atlas Impala MkI flown expertly by Mike Weingartz provided other jet action. An 8-ship Yak formation comprising of 6 Yak52s and 2 Yak18Ts flew a few circuits and then performed a formation break in front of the crowd. The South African Police Services Airwing staged a simulated hijack and rescue exercise to demonstrate its operational capabilities. Two Eurocopter AS350 Squirrel helicopters were part of this display. The SAPS Airwing also flew a formation with the two AS350s, a Robinson R44 helicopter and the Pilatus PC-6 Porter. Other displays included a formation display by two Piaggio P-166 Albatrosses flown by Ralf Dominick and Brian Gruar and solo displays by Johnie Smith's Slick 360, Warren Haslam's new Sukhoi 29, the Pacific Aircraft Company's P-750 XSTOL flown by Chris Briers and a Bell 407 Helicopter from Starlite Aviation. The parachute display included a tandem jump by Dr. Michael Sutcliffe, Durban's Municipal Manager. Participation of the South African Air Force (SAAF) was limited to the displays flown by the Silver Falcons, the official display team of the SAAF. The Air Force is currently limiting its participation at air shows and concentrating its resources on supporting events like the FIFA Confederations Cup that took place in South Africa recently and next years Soccer World Cup. Proceedings on the Saturday closed with a sunset show flown by the Snake Microlight Formation, which used a lot of pyrotechnics in their display and the spectacular Harvard Night Show. Besides flying with all their lights on, the four Harvards are fitted with special lights that shine into the exhausts of the engines and illuminate the flames in the exhausts. The Sunday programme, although shorter than the Saturday one, featured many of the same acts. Proceedings kicked off with a mass radial engine display. As there were 8 Yaks and 8 Harvards at the airport, it was decided to get all 16 planes into the air together. The two formations of 8 planes each flew over the airport one behind the other. The Mirage IIICZ performed its Sunday display at midday. After the display, Lt. Col. Glen Warden took the plane straight home to Air Force Base Hoedspruit and thus the plane was too heavy with fuel to perform another touch-and-go. 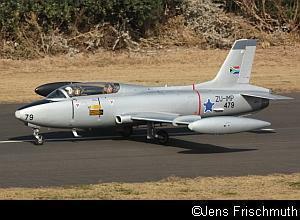 The Sunday at the Durban Airshow is traditionally the day when the Reach for a Dream Raffle takes place. The raffle is sponsored by Dennis Jankelow and Associates, the aircraft insurance company, and all proceeds go to the Reach for a Dream Foundation. 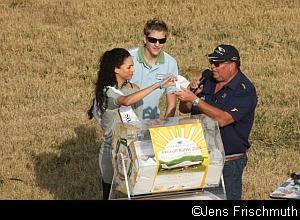 This year, the holder of the winning ticket, drawn by Miss South Africa, won a Piper Cherokee 235 aircraft and a Private Pilots Licence from 43 Air School. Sunday saw a short take-off competition between the Pilatus PC-6 Porter and the PAC P-750 XSTOL. Both planes managed to get airborne in just over the length of one of the white lines on the runway, which is about 35 metres long. Proceedings closed on the Sunday with a display by the Silver Falcons. 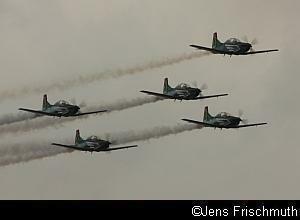 To add variety to proceedings, they performed their flat (bad weather) routine, although the weather would have allowed them to fly their normal routine. The team, comprising of Maj. Scott Ternent, Capt. Roy Sproul, Capt. Buti Tsebe, Capt. Gerhard Lourens and Maj. Nico Frylinck flew polished displays throughout the weekend and were freely available to sign autographs and chat to spectators. They, the other pilots and the many people who worked tirelessly in the background to stage this event all made the 2009 Durban Airshow a huge success.